Is Chanchal Mishra Stalling Court Proceedings ? This world is a curious place to live in. More so, when people start acting so differently in same cases that you start doubting if that's the same guy talking. Hail to prejudice and bias. 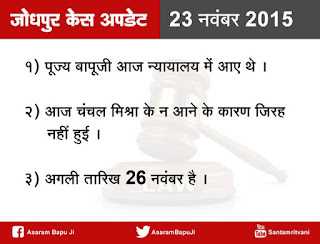 This supposed bias that people have against under-trial Asaram (Bapu) stands exposed once again by court (non) rulings in curious case of non-availability of Police Officer Chanchal Mishra. Starting from Dec 1, Chanchal Mishra has repeatedly failed to appear before court on 1st, 2nd, 3rd, 4th and now 8th Dec. 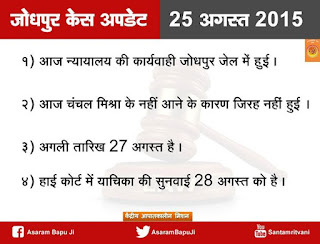 This means out of 8 days, court has convened for 5 days but was unable to proceed further in finding out the truth because Chanchal Mishra did not come. 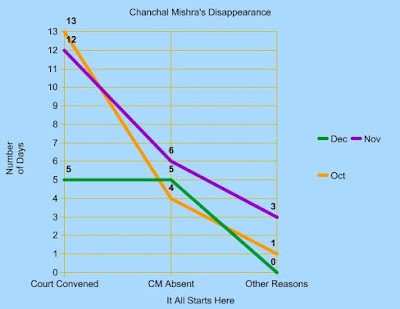 Tracking back from Nov 30, Chanchal Mishra could not show up in court for cross-hearings on 23rd, 7th, 6th, 4th, 3rd, and on 2nd. 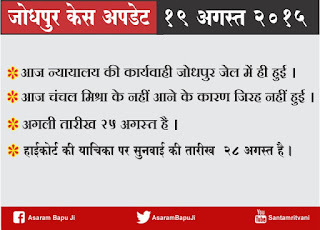 Pujya BapuJi could not come on 19th and Judge on 20th and 26th. 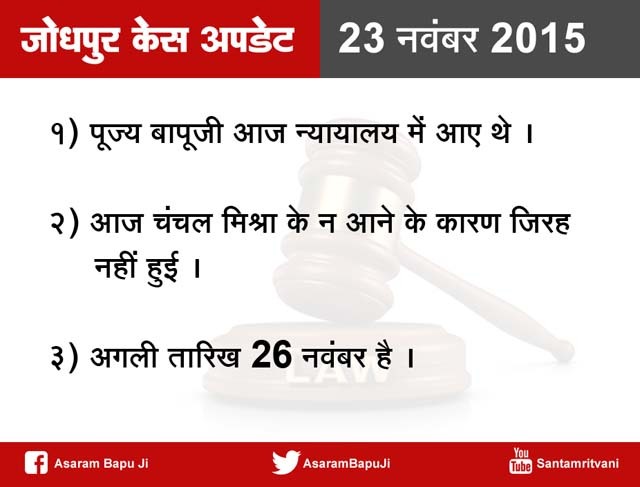 All in all, out of 30 days, court convened on 12 days of which it functioned only for 3 days. Then comes the month of Oct, (Ok not speaking ideally, I'm on backtrack, remember :}). 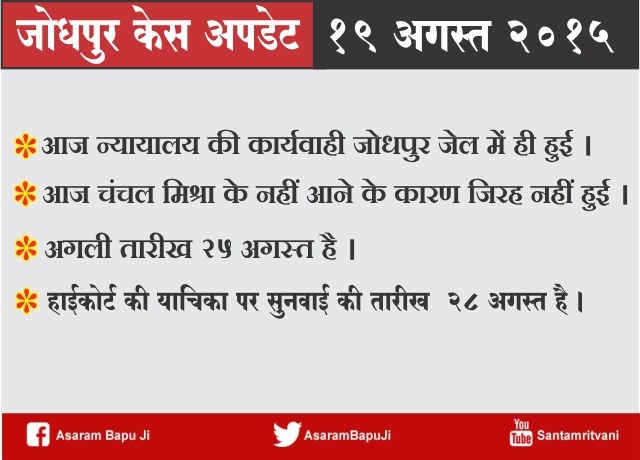 So, due to inadequate police, BapuJi couldn't be bought on to court on 5th, so I guess the court didn't function as before on that day too. 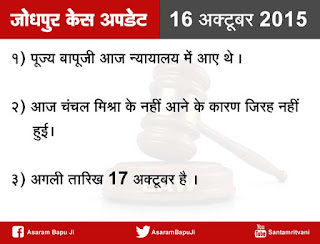 Then, Chanchal Mishra did not come for 17th, 16th, 14th and 1st. 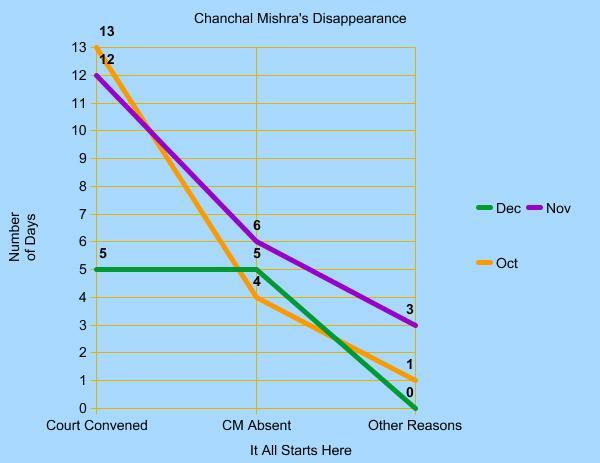 Tracking a graph for these, we find this that out of 69 days available from Months of Oct-Dec (till date), court could only convene for 30 days, even of which Non-Availability of Chanchal Mishra herself, led to 15 days of non-functioning, while Other Reasons amounted to loss of 4 days. But then Edison Haines once quoted, "Law is not justice and a trial is not a scientific inquiry into truth. 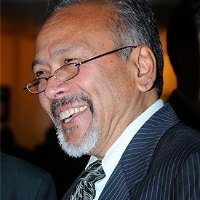 A trial is the resolution of a dispute"
The other very important inference, I personally draw out here is the reaction of the court itself. 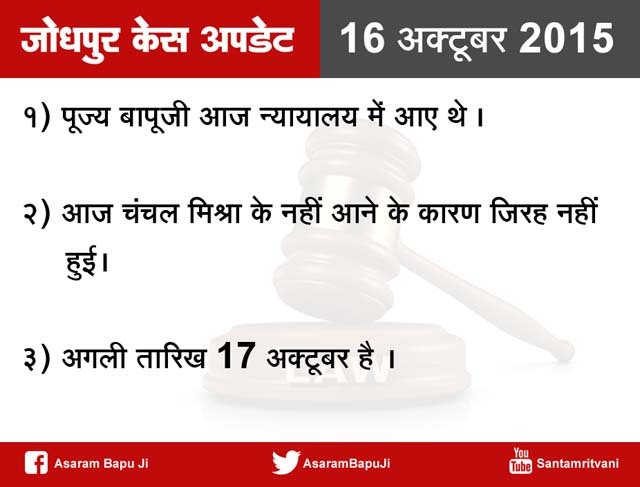 Recently when, defense side requested for call records of the accuser girl and her family from dates of August 13 to 16th, 2013 because that had not been put on records till date, the sitting judge promptly rejected this by quoting - These details should have been called during the testimony of the victim and her family in the trial court. "But seeking them now at the fag end of the trial, is just a move to stall the trial". And very very surprisingly, when the prosecution (Girl's Side) moved a request to summon the nodal officer of the telecom company by whom the call details was provided to the investigation officer. The defense in its argument, retaliated that - 'defense of the accused has already been closed and it would be prejudiced to allow this pray of prosecution'. Then what was the judgment passed? Testimony was closed here too but No! The Judge allowed summoning the nodal officer of the telecom company with a liberty to the defense to cross examine him. I guess both orders were released during same time period. This glaring non-attendance finds no details in Media. Chanchal Mishra, a sworn officer on duty is bound to do her work diligently and without delay. As such, appearing for court trials and keeping her investigation on records and participating in questioning and cross-questioning from both defense and prosecution is one such task. Yet, we wonder what is it that impend her regular attendance at Jodhpur Court these days? Of course, we understand she is a police officer, no wonder a dedicated, hard-working and capable lady and So, in no way do I mean to even suggest that she is showing any dereliction towards her duty. We also understand that we live in 21st Century where means of communication are considered to be very fast and reliable. What then does it take for Chanchal Ji to place a simple communication protocol to concerned departments per-mediating her schedule of attendance? Why that court everyday adjourns to convene on subsequent day, keeps waiting till and more from destined time, and then facing defeat adjourns for the day? If Chanchal Mishra is on leave, surely the court would be appraised of the same. 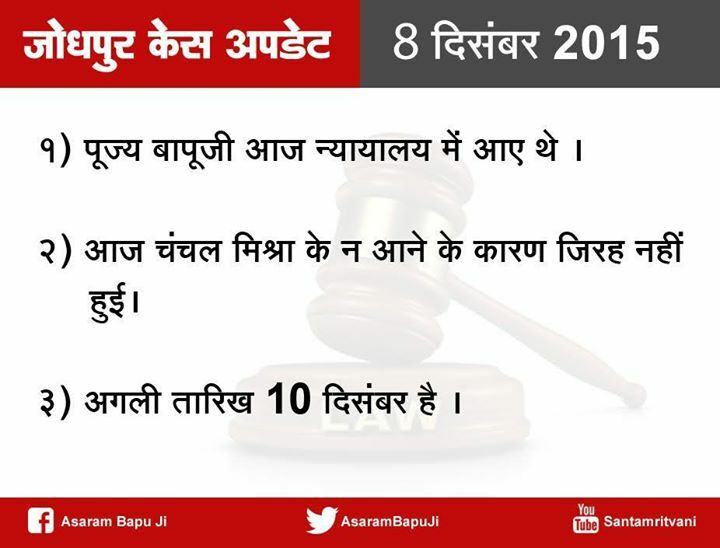 And court without wasting people's money and both Asharam Bapu's time and efforts, give a suitable date or fix an alternative agenda for the day. But No! Neither does the court take cognizance of the fact that continued absence of Chanchal Mishra is "STALLING" the day-to-day proceedings of this very important case which is to be already run of Fast-track but it also does not fill the time in. Who is Wasting Public's Money ? Recently, News24 had organized a debate targeting Asharam's railway travel to Delhi for AIIMS Medical Checkup as a tool of how few men wring in even the justice system to their comfort, or how defense is wasting huge amount of taxpayer's money by traveling in train and getting diagnosed with all types of diseases. When Asharam Bapu travels from Jodhpur to Delhi in Mandore Express, whose fare is a mere 960?- the media goes berserk howling in madness and grief. But When Sanjay Dutt gets easy pay-roll or food from 5-Star Hotels, where do the same media go? Also, relevant in one of Subramanian Swamy 's tweet regarding taxpayer's money in this case, which reads - as below. This was tweeted on 6th July this year, and garnered a response from Former Ambassador to Japan, from Nepal. 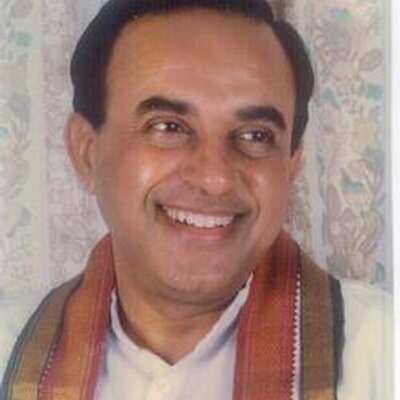 "I told the Home Minister Rajnathji today that the case against Asaram Bapu is bogus and public money should not be wasted on prosecuting it "
"Better we appeal to Indian Judiciary that what harm the secto-genarian Asaram Bapu ji will do if granted bail? Nepal"
This, my article, is not in a bid to target Chanchal Mishra or anyone personally or disrespect Indian Courts in anyway. I am sure, there are so many noble and selfless police officers out there and Chanchal Mishra could be one of them and Courts which have guts to uphold cases like Shah Bano even on front of united opposition by legislatures are sure to be respected. I only write this, in a way to highlight some of the passages which I find to be inconsistent and in opposition with each other.